Cindy Sheehan will be at Martha’s Vineyard beginning August 25 a short way from Obama’s vacation paradise of the celebrity elite but very far from the Afghanistan and Pakistan and Iraq where the body bags and cemeteries fill up each day as Obama’s wars rage on. She will remain there from August 25 through August 29 and has issued a call for all peace activists to join her there. For those of us close by in the New England states and in New York City, there would seem to be a special obligation to get to Martha’s Vineyard as soon as we can. 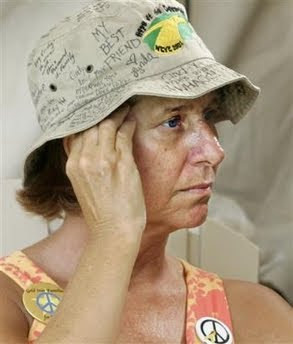 A funny thing has happened on Cindy Sheehan’s long road from Crawford, Texas, to Martha’s Vineyard. Many of those who claim to lead the peace movement and who so volubly praised her actions in Crawford, TX, are not to be seen. Nor heard. The silence in fact is deafening, or as Cindy put it in an email to this writer, “crashingly deafening.” Where are the email appeals to join Cindy from The Nation or from AFSC or Peace Action or “Progressive” Democrats of America (PDA) or even Code Pink? Or United for Peace and Justice. (No wonder UFPJ is essentially closing shop, bereft of most of their contributions and shriveling up following the thinly veiled protest behind the “retirement” of Leslie Cagan.) And what about MoveOn although it was long ago thoroughly discredited as principled opponents of war or principled in any way shape or form except slavish loyalty to the “other” War Party. And of course sundry “socialist” organizations are also missing in action since their particular dogma will not be front and center. These worthies and many others have vanished into the fog of Obama’s wars. Just to be sure, this writer contacted several of the “leaders” of the “official” peace movement in the Boston area – AFSC, Peace Action, Green Party of MA (aka Green Rainbow Party) and some others. Not so much as the courtesy of a reply resulted from this effort - although the GRP at least posted a notice of the action. (It is entirely possible that some of these organizations might mention Cindy’s action late enough and quickly enough so as to cover their derrieres while ensuring that Obama will not be embarrassed by protesting crowds.) We here in the vicinity of Beantown are but a hop, skip and cheap ferry ride from Martha’s Vineyard. Same for NYC. So we have a special obligation to respond to Cindy’s call. “Now that she’s headed to Martha’s Vineyard, the State-Controlled Media, Charlie Gibson, State-Controlled Anchor, ABC: ‘Enough already.’ Cindy, leave it alone, get out, we’re not interested, we’re not going to cover you going to Martha’s Vineyard because our guy is president now and you’re just a hassle. You’re just a problem. To these people, they never had any true, genuine emotional interest in her. She was just a pawn. She was just a woman to be used and then thrown overboard once they’re through with her and they’re through with her. They don’t want any part of Cindy Sheehan protesting against any war when Obama happens to be president." Limbaugh has their number, just as they have his. Sometimes it is quite amazing how well each of the war parties can spot the other’s hypocrisy. But Cindy Sheehan is no one’s dupe; she is a very smart and very determined woman who no doubt is giving a lot of White House operatives some very sleepless nights out there on the Vineyard. Good for her. Obama is an enormous gift to the Empire. Just as he has silenced most of the single-payer movement, an effort characterized by its superb scholarship exceeded only by its timidity, Obama has shut down the antiwar movement, completely in thrall as it is to the Democrat Party and Identity Politics. Why exactly the peace movement has caved to Obama is not entirely clear. Like the single-payer movement, it is wracked by spinelessness, brimming with reverence for authority and a near insatiable appetite to be “part of the crowd.” Those taken in by Obama’s arguments that the increasingly bloody and brutal AfPak war is actually a “war of necessity,” should read Steven Walt’s easy demolition of that “argument.” (2) Basically Obama’s logic is the same as Bush’s moronic rationale that “We are fighting them over there so we do not have to fight them over here.” There is a potential for “safe havens for terrorists,” as the Obamalogues and neocons like to call them, all over the world; and no one can possibly believe the US can invade them all. However, the ones which Israel detests or which allow control of oil pipelines or permit encirclement of China and Russia will see US troops sooner or later. The bottom line is that everyone in New England and NYC who is a genuine antiwarrior should join the imaginative effort of Cindy Sheehan in Obamaland this week and weekend. We owe it to the many who will otherwise perish at the hands of the war parties of Bush and Obama. Or go to Antiwar.com and make a contribution while you are there. It’s almost as good as CounterPunch.com. The Afghan War Is Winnable ? Surrealist Group : No War on the Moon! Did Obama Make a Deal with Big Pharma? American Ignorance or American Arrogance? Gog, Magog and the Burning Bush! 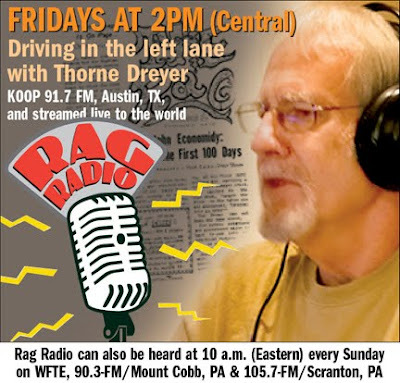 Town Hall Crazies : Too Nuts for Jerry Springer? Health Care Reform : Screeching to a Halt? Fascist America : Are We There Yet? Peak Oil: Will It Be Sooner Than We Expect?